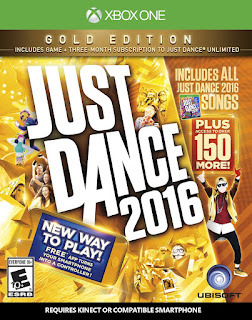 Today (11/25) ONLY get Just Dance 2016 for $24.99 (Retail $49.99)! This is the only discount we have seen so far and it includes all platforms so grab it while you can! No Kinect sensor required - Try Just Dance 2016 today with the FREE demo and the FREE Just Dance Controller App - your smartphone* scores your dance moves! The Ultimate Tracklist - from the hottest hits like "Same Old Love" by Selena Gomez, "Want to Want Me" by Jason Derulo, and "All About That Bass" by Meghan Trainor - to fun favorites like "Born This Way" by Lady Gaga, and "I Gotta Feeling" by Black Eyed Peas, and more! Sweat Mode is back and better than ever - Burn calories with personalized workouts. New game modes = fun for everyone - Work together to get a high score in Dance Party, unlock Dance Quests to beat the game, plus more!